news 04/05/19: daily updates - Maciejowski Bible chopper (last one 04/05), 13th century Maciejowski Bible faussart (featured 04/04), 16th century German mace (featured 04/02), German klappviser bascinet (singular, featured 04/01), M1833 Texas Dragoon saber (featured 03/26), War flail (featured 03/25). news 03/22/19: daily updates - Nepalese kukri plus machete (new! added 03/22), Miao dao - Chinese long saber (new! added 03/21), Oda Nobunaga katana (new! added 03/20), Confederate staff & field officer's sword (featured 03/20), Date Masamune katana (new! added 03/19), Steel rotella shield (featured 03/19), Takeda Shingen katana (new! added 03/18). Please see the News Updates page for older announcements. 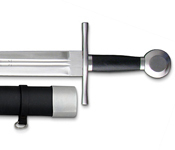 These swords are all sharp, meant for test-cutting training and for collectors and reenactors who want a real sword. Many of these swords have a corresponding blunt version for training and reenactment and stage combat performances. 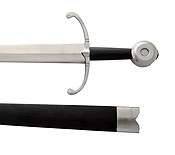 Museum Replica swords - these are "edged" rather than outright sharp, perfect for light sparring and dress and costume and demo and faire and stage wear. Howdy, folks. My name is Hal Siegel, but I've been known as Therion in the medieval and renaissance re-enactment community and various internet communities since 1982 (yes, I really did have internet access back then - via Arpanet and Bitnet). For over thirty-five years I've been an arms and armor collector, researcher, and student of both oriental and western martial arts. At the beginning of 2001 I decided that it was time to make my hobbies and passions into my business - thus began TherionArms, offering a hand-picked selection of what I think are the most interesting and well-made historical reproductions, as well as antique weaponry from around the world. Here at TherionArms, you will receive personal service from a professional who as been studying (and using!) weapons and armor for decades, not some shop monkey in a warehouse who doesn't know anything about swords and armor except for the stock number. Every item I ship I personally inspect, approve, and securely package myself. Standard delivery time for Antique & Ethnographic items is usually about one week, for Reproduction items is usually a week but may be up to two or three weeks. Occasionally my Reproduction manufacturers can't keep up with the demand and I'll have to place your request on backorder. For items on backorder, your Verisign Visa/Mastercard purchase will not be charged until shipment is nigh. Payment methods: Credit cards accepted via PayPal or Verisign Visa/Mastercard through the shopping cart, or by phone: toll free 855-778-4374. Personal checks, bank checks, and money orders can be mailed to TherionArms -- PO Box 187 -- Del Valle, TX, 78617. The shopping cart system can be used to check shipping rates for check or money order purchases - the payment page comes after the shipping information page. The Government requires that I collect a sales tax of 8.25% for any item shipped to a Texas address. The shopping cart or PayPal will include that for you automatically, podnuh. This isn't just a business, it's a passion, and I'm confident that you'll be happy with my products. Please check my eBay feedback (860+!) or ask on any sword or armor forum message board for references. 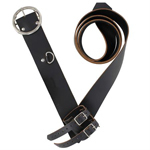 Satisfaction guaranteed or return within two weeks in original condition for full refund less exact shipping charges. I don't believe in "restocking fees", they're mean and impersonal. Note that this does not apply to armor and accessories purchased right around Halloween - sorry, we're not a costume rental shop. A purchase indicates that you have read and agree to The Fine Print detailed at the bottom of the Ordering page. TherionArms isn't a giant mega-corporation with a call center and dozens of employees scuttling about in a huge warehouse (yet). Emails and phone calls will be answered as soon as possible, but please be patient if I don't get back to you right away - there's so much work to be done! "Are your swords 'battle ready'?" I never use that term, it's completely bogus. All of the swords and weapons on TherionArms are real, historic, and fully functional (sharps or blunts) - and if I offer a wall-hanger because it's inadvertently nifty because the manufacturer got something very right. Decorative/wallhangers are clearly labeled as such. "I live in (Texas, somewhere near Austin) - do you have a storefront I can visit?" Nope, sorry, TherionArms is mailorder only. I do, however on occasion, meet up with folks in Austin for local deliveries - usually somewhere near a theater I'm working at (that's my other profession - theater tech). "Where can i get the small medieval figures you send along with your products?" All shipments from TherionArms may contain trace amounts of cat fur. Sorry, can't help it.